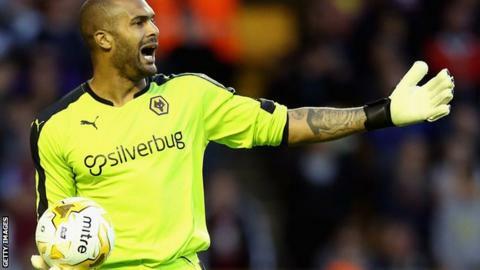 Wolves goalkeeper Carl Ikeme has been included in the Nigeria squad for the 2017 Africa Cup of Nations qualifier against Tanzania next month. New Super Eagles coach Sunday Oliseh has stuck largely with the same squad as predecessor Stephen Keshi. But there are recalls for UAE-based forward Emmanuel Emenike, Werder Bremen striker Anthony Ujah and midfielders Lukman Haruna and Obiora Nwankwo. Chelsea midfielder John Mikel Obi and winger Victor Moses miss out. Académica de Coimbra's Nwankwo has been overlooked since the country's Nations Cup win in 2013, while Anzhi Makhachkala's Haruna has not played for his country since the 2010 World Cup. There is no place for Watford striker Odion Ighalo. He was in the squad for Nigeria's first 2017 Africa Cup of Nations qualifier and scored in a 2-0 win over Chad in June. Captain Vincent Enyeama will lead the 18 foreign-based players to Abuja where they are expected to join up with 23 Nigeria-based players by 31 August. "Coach Oliseh has fulfilled his promise that only players playing regularly at the top level will be invited," Nigeria Football Federation spokesman Ademola Olajire told BBC Sport. "This is a new opportunity for some old players as well players who have been on the fringes of the squad. "The locally-based players are already in Abuja, now the preparations can truly begin for Mr Oliseh and his players."